Gator provides a wide variety of jaws for both scroll and independent chucks. Gator Master, Hard and Soft TOP Tongue and Groove Jaws are produced to ANSI (American National) Standards. We stock replacement jaws for ALL of our Gator Chucks. 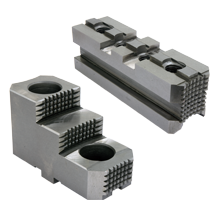 All Gator Chuck Jaws are produced with high quality Alloy Steel and are precision ground and heat treated. Master Jaws for Scroll Chucks - Tongue and Groove Master Jaws for Gator and some *Bison Scroll Chucks. Sold in sets. Top Jaws for Scroll Chucks - ANSI Standard, Tongue and Groove Top Jaws. Gator ANSI Standard Top Jaws will work with ANY other manufacturers Master Jaws as long as they are produced to the same ANSI Standard. Sold in sets. Soft Top Jaws for Scroll Chucks - ANSI Standard, Tongue and Groove Soft Top Jaws. Gator Soft Top Jaws will work with ANY other manufacturers Master Jaws as long as they are produced to the same ANSI Standard. Produced with carbon steel but not heat treated. Sold per piece. Hard (ID & OD) and Soft Solid Jaws for Gator Scroll Chucks - For Gator Scroll chucks, and some *Bison Scroll Chucks. Master Jaws for Independent Chucks - For use with Gator Independent Chucks. Top Jaws for Independent Chucks - ANSI Standard, Tongue and Groove Top Jaws. Gator ANSI Standard Top Jaws will work with ANY other manufacturers Master Jaws as long as they are produced to the same ANSI Standard. Sold in sets. Soft Top Jaws for Independent Chucks - ANSI Standard, Tongue and Groove Soft Top Jaws. Gator Soft Top Jaws will work with ANY other manufacturers Master Jaws as long as they are produced to the same ANSI Standard. Produced with carbon steel but not heat treated. Sold per piece. Hard Solid Reversible Jaws for Independent Chucks - For use with Gator Independent Chuck.